A missing master vampire, presumed long deceased, is found chained in a pit…undead, raving mad, and in the company of two human bodies. Now it’s up to Jane to find out who kept the vampire hidden for so long and why, because the incident could tip already high supernatural tensions to an all-out arcane war. The Witch Conclave is planned and it’s up to Jane Yellowrock to protect Leo and the witches. Unfortunately there are two witches with amped up powers that are targeting the Witch Conclave and Jane. Their goal is to see that the conclave doesn’t happen. But attacking Jane personally is NOT going to end well. Leo is trying to get everything situated before the European vampires make an appearance. But when a master vampire is discovered locked in a well, starved and insane things are going to take a turn for the worse. But this is nothing new in a day of Jane Yellowrock. 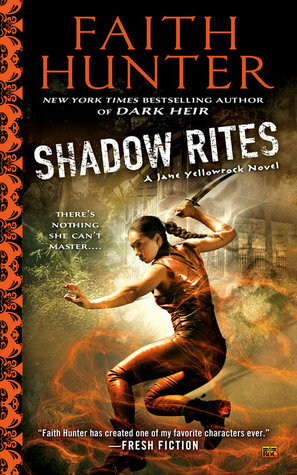 Jane Yellowrock is one of my favorite characters and since this is the 10th book in the series I’m clearly not the only one. Jane is trying to keep everyone safe but just keeps finding herself hip deep in trouble. It seems all of those spells she has taken over the years are finally starting to catch up with her. I really loved seeing all of the old characters and seeing how they have grown. I have loved reading Faith Hunter’s stories since I first read Bloodring. The Jane Yellowrock series is one of my favorites and I love watching everything happen to Janes and seeing her get everything taking care of. If you like fantasy stories you need to get this book. Although I recommend reading the rest of the series, it will make you feel more comfortable with the story. To purchase Shadow Rites make sure to check out Amazon, Barnes and Noble, Goodreads and Faith Hunter’s website. I received Shadow Rites for free from the publisher in exchange for an honest review. (Excerpt from Goodreads) Haven’s crew find Jordan Grant half-dead floating at sea. With a six-year hole in his memory, he remembers nothing of the Incident or the Lurchers who have claimed the land as their own. He joins the crew in their daily struggle to survive in a harsh new world where every meal is live or die. But when a shipwreck forces them from the safety of the sea, the crew soon discover their pursuers aren’t the only monsters out to get them. I small crew of people live on the Haven, a ship to avoid the zombies on land. One day they discover a body that looks like a water-logged zombie but is actually a human. They bring him on board and start nursing him back to health. They learn they have save Jordan Grant who is suffering from amnesia and cannot remember the last 6 years of his life. Jordan takes the news of the zombie apocalypse a little hard but finds a place in this group. But things are about to get rough and not everyone is going to make it. This is the first part in a two season, five book each series. Although the story is not very long, 170 pages, I instantly got sucked in. This small group of survivors has limped through what is left of life on a boat that is falling apart and pieced together with whatever they can find or scavenge from other boats/ships. Then enters Jordan. He remembers leaving a base but nothing else. And being on a boat that is already falling apart means they are running on borrowed time. This is a shorter story so there is not a whole bunch of character development but it would be the same way if you were in this position. Just from this book I have the two complete collections in my wish list and have purchased Perrin’s other book Swiss Family RobinZOM. I can’t wait to get reading that one too. 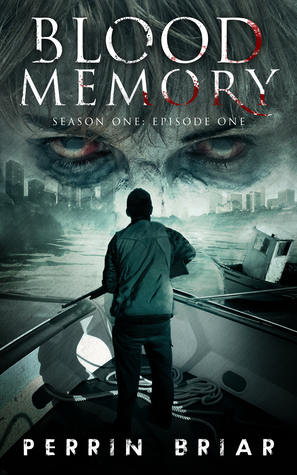 To purchase Blood Memory: Season One, Episode One make sure to check out Amazon, Barnes and Noble, Goodreads, and Perrin Briar’s website. I purchased Blood Memory on the recommendation of someone in Perrin Briar’s launch group. Timothy Brennan is seventeen and miserable; life unravels by the day. Driven to the brink of suicide, a fae creature intervenes and together, they discover there is more to Timothy than anyone knew. Learning that his mother’s death was murder, he begins a journey of revenge. The teen must now decide what to do about his new world before those who want to destroy the old ways find him… and kill him. If he can stay alive, Timothy may well be the key to restoring the lost realm of Alfheim. Gary Nilsen was born and raised in Brooklyn and Long Island, New York, but his career and interests have taken him far afield. In the early 1980s he spent five years living in the Kingdom of Saudi Arabia while working for an international group of companies. A decade later, his interest in underwater archaeology, found him teamed with a research fellow from The Institute for Nautical Archaeology and working on the excavation of an ancient shipwreck in the Red Sea. Gary has written articles on marine archaeology, appeared on a special edition of Who Wants to Be a Millionaire, authored two novels, and recently received an MFA in Fiction Writing. During his tenure in the masters’ program, Gary was awarded the university’s Robert J. Begiebing prize for a writer who demonstrated high literary promise. He currently resides in New York with his love Nancy and their two Old English Sheepdogs, Harry and Nana. With a tiny bit of effort, he could make all the anxiety go away. In just seconds, he could be pain-free, and the thought didn’t even scare him. It felt good. It felt right. It was the compulsion to leap off the cliff, and there was no conflicting emotion to resist. He didn’t know anything about drowning, but how difficult could it be? A simple breath to let the water into his lungs? Not so bad. Timothy slid his leg over the railing and stepped onto a narrow ledge of wood. Holding on, he moved his other leg over so that he stood facing the water. He took a last deep breath, filling his lungs with cool night air. The moon had risen just above the tree line, lighting the forest with a silvery glow and reflecting off the water ten feet below him. He leaned forward, one foot stepping onto nothingness. A slight pause, and his fingers slipped from the bars. Timothy plunged below the surface of the water. A thousand tiny needles of pain stabbed him as the frigid water attacked his skin. He’d given no thought to how cold it would be. He gasped. A trickle of water slipped down his throat, and his air passage shut down involuntarily. He choked but couldn’t take a breath of relief. The strong current was pulling him along, and he somersaulted as he started to float toward the surface. When his face broke into the air, he tried to take a breath but still couldn’t. The laryngospasm wouldn’t release. He pushed down on the water with his hands to keep his face up, but his arms were growing weaker as his body tried to conserve its blood flow to protect his lungs and brain. He opened his mouth, and his sealed lungs fought for control of his body, forcing him to gulp and swallow several mouthfuls of water. He started feeling dizzy and slipped under again. He kicked weakly with his legs, but the effort was too much. With one last push, he broke the surface, his vision blurred from lack of oxygen. His last thought before blacking out was how beautiful the stars looked; then his eyes rolled back, and he sank into the depths of the river. Timothy has recently lost his mother and is living with his horrible uncle. He has several issues that make him one of the main targets for bullying at school. One day he has enough and decides to try and kill himself. Thankfully Aenya was there to save him. She is fae and recognized Timothy. Together they learn that he is the seventh son of a seventh son and very powerful. They return to Ireland where Timothy meets his Grandmother and learns that he may be the one to restore Alfheim. But it’s not going to be easy, his uncle and others want to use him to help them rule the world. I really liked this story. Poor Timothy is just having such a hard time and even when he learns the truth yet he still doubts himself. He does have to fight his hatred for his uncle but he is such wonderful person that the good in him will win. I loved watching him grow thorugh the story. Although he has doubts seeing how others are stepping up with their own fears helps him to keep fighting. This is a great young adult story that will appeal to everyone. I can’t wait to read more from Gary Nilsen. To purchase Alfheim make sure to visit Amazon, Barnes and Noble, and Goodreads. I received Alfheim for free from Sage’s Blog Tours in exchange for an honest review.